According to information on Mikrotik WIKI and forums, it is not possible to recover the passwords without resetting whole mikrotik box (resulting in loss of all configuration also). However following are few methods to recover the password. If you require it on urget basis, you can email me your config, and I will recover it for you, just in case if you dont have linux or urgency is required. It will show you all account passwords in few seconds. (I used Ubuntu 9.1 Desktop CD in this example, you can download it from following link. you will see something like below image. You partition can be different, use your judgment to see what partition mt is in, either by mounting it one by one. Now Copy the ‘mikrotik password file’, (in newer ROS , it is located in /rw/store/user.dat) to USB flash drive, It will be used to decode the password. then Boot from your Ubuntu box, and use the Method # 2 , described earlier in this article to decode password using mtpass tool from this file. Copy the user.dat file where you have decompressed mt password tool . e.g /temp , now use the mt pass tool to recover password from this file. and you will see your admin password. If your architecture is ROUTERBOARD RB series, Please follow the below guide. You can setup an script just in case you forgot your password , and via sending sms, it can reset it to default. or send you return the new/original password. How are you Jahanzaib bhai…. Please give me your number i want to ask you some question about mikrotik iam very new plz plz plz i will never distrub u again n again…. Very good your site man, maybe you can help us to learn how to install the mikrotik (without GUI) in a virtual machine in UBUNTU plz, so we can get the mikrotik + cache and other tools in one unique PC ;). We use our own Radius and Mikrotik as NAS for PPPoE & Hotspot users. The thing we require is dynamic queues for users getting connected. Eg. day 512 kbps and night 1 mbps. From Mikrotik forum we’ve got that it cant be done for PPPoE coz Mikrotik doesn’t supports CoA, but can be achieved for Hotspot users. Any idea how it can be done? Well I have used Radius Manager along with Mikrotik and it works fine. You mean its applicable for both PPPoE & HotSpot clients ? 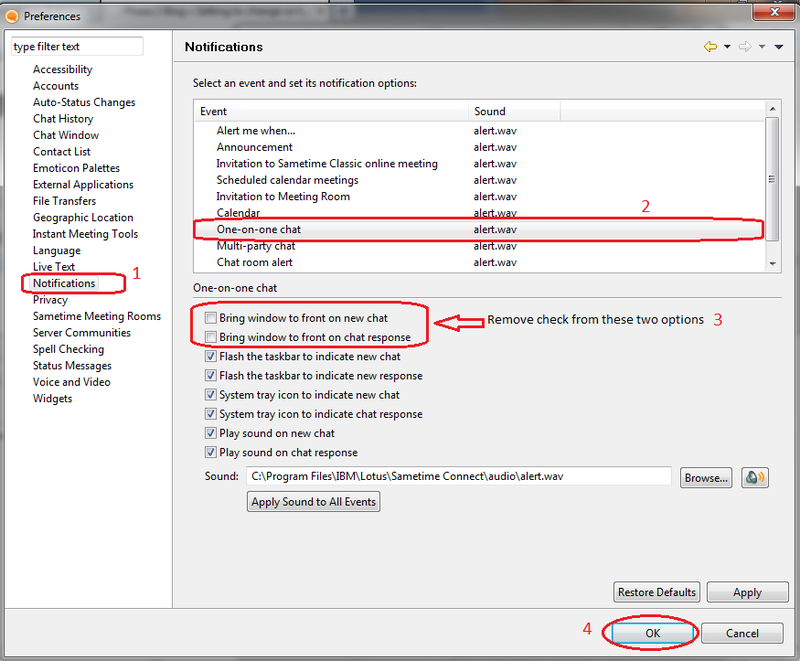 But cant see any option of configuring that while creating new services in Radius manager. Just have the option of Data rates along with Burst limit, threshold and time. How do give someone 512 kbps from 6 am to 8 pm and 1 mbps from 8 pm to 6 am. ???? 3.x is way too old. if you use mikrotik 63. or lesser, then dma 4.1.x series will still work fine. If we have Radius manager and Mikrotik NAS, and if we want to use it for Hotspot. So is it possible that the DHCP pool on NAS is private say 10.5.50.0/24 and after guests gets logged in, the guest should be provided with a public ip from a public pool say 1.1.1.0/25 for that session (till the time the user is logged in) after the user logs out the ip should be free. The assignment of Public IPs to private IPs (after users gets logged in) should be random. So, can Radius Manager keep session logs of users along with logged in time, logged out, its private ip and also public IP. I earlier tried doing netmap of src-nat and dstn-nat, but there was no logs maintained of which private ip is assigned to which public ip. Even Mikrotik support says that there isnt any option currently to log the netmaps. We have to maintain fool-proof security as per the law of DoT, thus need to allocate users with unique Public Ip for each login (and not masquerade). And the problem is that we have very limited Public Ips (but enough to allocate the live concurrent users). in my opinion, You can define in RADIUS to provide Live ip to user via live public pool (live ip pool for users created in Mikrotik), so when mikrotik will assign any ip to user, it will log this entry. in Logs, you can see what ip was assigned to which users. That’s true when we have PPPoE clients, since IP is allocated only after users logs in (By Radius) but how can that be possible while using HotSpot. Because any user getting connected to the HotSpot interface; Public IP will automatically be provided even when the user doesn’t logs in. That would result in wastage of Public IPs. I want public ips to be assigned only after users logs in. And that, either Radius should have the users Public IP detail of the session, or else Mikrotik should manage logs of which private IP is mapped to which public IP along with time-stamp (Logs send to Syslog server). Sorry I haven’t used hotspot anywhere so can’t guide you in the right path. Have you tried posting your query to mikrotik forum ? Maybe some one will come up with any work around. I am sure you will get good and authentic replies over there. We now have a network with Radius Manager and Mikrotik as NAS for PPPoE users. We have obeserved that while creating profile/plans like 1mbps day and 2 mbps night (7 am to 9 pm 1 mbps & 9 pm tp 7 am 2 mbps) on Radius Manager, the queue (rate-limit) of the pppoe users does not changes on the fly but if the user logs out and logs in again at the night time the user gets the queue of 2 mbps. Mikrotik support says that CoA is only for HotSpot and not for PPPoE thus cannot change rate-limit of connected pppoe users. CoA for PPPoE only supports DM (Disconnect-Message) or so called PoD(Packet of Disconnection) to disconnect the connected pppoe users. Is there any solution which can change the queue/rate-limit of the pppoe users on the fly without disconnecting the users. Change on the fly is Not supported for pppoe clients. No proper solution for this. I made an ugly workaround for this that I configured a script on Mikrotik PPPoE Server which disconnects all sessions on Mikrotik at 12:00am, and 12pm to enforce rate changes. Can you please share the script configuration which you’ve mentioned above ?? Also anything done on Radius Manager or just on Mikrotik ?? Also read this. a bit advance, but works according to this guy on the forum. How can it be fixed….? Hello, we require load balancing along with failover. Eg LAN – 192.168.1.0/24. WAN 1 (interface ip) – 10.10.1.2 g/w 10.10.1.1 WAN 2 (interface ip) – 10.10.2.2 g/w 10.10.2.1. User with IP 192.168.1.2 could use WAN 1, user with IP 192.168.1.3 could use WAN 2 (using 2 different gateways @ the same time kind of load balancing) Similarly even other connected nodes on LAN should be distributed between 2 different gateways. And as soon as any one of the g/w is down the other should take over the whole LAN n/w. Again when the gateway is up load balancing should happen again. I would like to do username=ip address of subscriber for external AAA/Radius server. with Hotspot i am able to do mac authentication & other authentication. but I want to use ip address rather then mac for authentication. sir i cant login how can get backup bcos i forget password and username????? i have gone thru ur discription over recovering password bt my problem is that i hv not found back up file in my system n i m nt used to use linex or wtevere is third option so is there any other easy option to recover the password for dumb user like me……???? i will be gr8full to u. Do you have x86 version of mikrotik or RB ? Will this password recovery (Live CD) supports the latest x86 version (5.25)? When I try to copy the user.dat an error came out saying something like the file or directory does not exist. I am not familiar with ubuntu commands. Please tell me if I did the right thing. I am running mikrotik rb750gl billing on a wifi network. I don’t have enough knowledge about setting/configuration of mikrotik (someone had done this for me). i just want to ask, that i see many ip addresses in my ip/firewall/connections page even there is no any active user on my active user list. I have doubt that someone is using my wifi network without proper user name / password. Please reply me..
Dont worry, Connection tab shows any ip that mikrotik is sensing on network. But surely you should have proper firewall / security in place to avoid misuse of your internet/resources. Something like PPPOE server or hotspot. send the backup file and i will recover the pass for you. sir what is your Emaiil id ? where you sent it ? Sir thank you so much now i want to make a script of my all mikrotik RB settings how i can do this?? Many Thanks for all you eforts . also could I compile the file under windows using cpp compiler ? I have sent you a Bkp file to retrieve its admins passwords , many thanks in advance . A.O.A sir i just lost my mikrotik password and the website http://www.mikerotikpasswordrecovery.com has been blocked or temporary unavailable kindly i’m in trouble i can’t creaet my users in my mt router please help i’ll be highly thankful to you. sir i send you the backup kindly help thank you . We are using Mikrotik (5.14) on virtual machine VMWare. We are lost Admin password. Also we doesn’t have a backup file to restore and also we can to reset it because it is very much to restore rules after this. i have a make snapshot and make a OVF (Folder over file) export from VMWare ESXi (copy of mikrotik virtual machine) it is around 2.5 Gb. it is possible to get password or a backup configuration for mikrotik from this ? Hello Syed, your material is very helpful! Many thanks for the support anyway! How about sharing your findings with us please? I am haven’t backup file. How i do it? I want to recover my mikrotik password without factory reset. Please help me. I haven’t backup file. How i do it? I want to recover my mikrotik password without factory reset. Please help me. 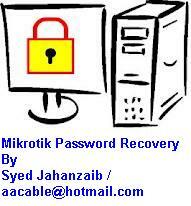 Officially, Without backup file, you cannot recover mikrotik password. Its by design. but sir ye bat clear krna chanta hon k Ubuntu ko cd pr write krna h ya kaisy thek rhy ga and sir usb flash pr Ubuntu ko download krna h ? 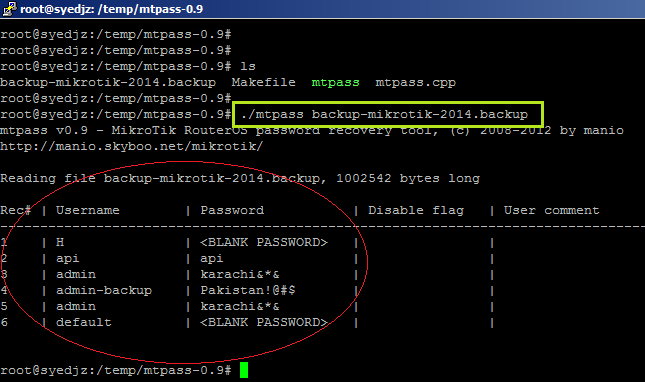 I have not backup file for mikrotik router.I forgotten my password.How I do that? please tell me. I inehited a router orad 750 which unfortunately I cannot mount in a linux system. I have a limited user which cannot copy two backup files that are stored in the router. Even with limited fuctionality I can connect to the router via HTTP or Winox. THis user though, can’t copy the backups from the router to my computer: “Could not download file – not permited (9)”. ANy suggestions on how can I access the router to copy the backup to get its password? when I type make after compile command it only shows this make: Nothing to be done for `all’. Recently i have change my mikrotik Admin password. after that i have no any backup & unfortunately i forgot the password. What can i do now. Pls help me. I m in so much problem. My e-mail id: manikbrs01@yahoo.com. Pls help me ……. I am getting this !!!! please tell me about, why not showing password . My name is shiva , i’m from India.My mikrotik winbox password was changed by some one it is at customer end, i dont have backup file and can’t re-install it because it is working condition at customer site. so please provide a solution for me to recover password. What exact version of mikrotik you are running? Is it a) x86 based OR b) hardware? if b) what model & fw version. Thanks for the reply Syed…i have lost both version bridges password , one is 6.23 and another 5.20 versions…please help me, the both bridges are at customer end so i cannot reinstall it and i dont have any backup file….actually someone intentionally hacked my bridges. if you have un-encrypted backup file, then you can recover, if not then you have to reset the mikrotik and do all config again.